Scientifically designed programs of progressive exercise with weights, proper diet, and a carefully detailed program of nutritional supplementation, enable female students to reshape, firm, and redistribute body weight. 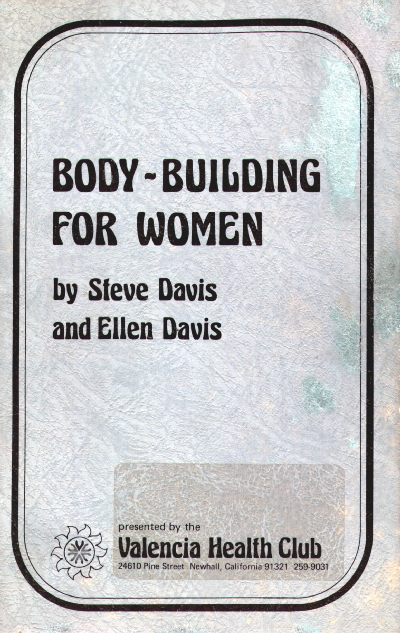 For decades there has been a great deal of ambiguity, confusion, and controversy as to women’s reaction to progressive resistance exercise. The so-called authorities in the health and beauty field have treated women as if they were inhuman creatures who were highly fragile, china dolls, who would melt if made to perspire. The woman who had the self-pride to seek to alter her figure was put through a mystical conglomeration of body wraps, steam baths, yoga classes, and electronic vibrating treatments. In reality, a woman’s muscular and skeletal structure reacts the same way as a man’s when exercised progressively and properly. Of course, hereditary restrictions, hormonal balances, and the normal layer of adipose tissue that lies between female skin and muscle, prevents a female from developing the defined musculature of a man. Here at the Valencia Health Club, in Southern California, these theories were put to the test. Scientifically designed programs of progressive exercise with weights, proper diet, and a carefully detailed program of nutritional supplementation, have enabled our female students to reshape, firm, and redistribute body weight. In short, to regain and maintain that priceless commodity, feminine beauty.